I had a little bit of extra time the other day (which is unusual but I hit every green light in town!) before we had to pick Big Sister up from school and I saw a beautiful loquat tree full of tiny, plump yellowy-orange fruit ripe for the picking! I don't know who's tree it was (thank you to whoever planted it on the side of the road!) but since the ground was littered with fruit that had fallen I figured it was a neglected tree and needed some love! We pulled over and reached for the fruit. Originally I had planned on three total loquats as we are working on counting to three with Little W, but they were so delicious looking I couldn't stop. So we grabbed a bowl from the car and started collecting. While we worked, we talked about so much more than just counting to three! Vocabulary is one of the most important language areas to work on. This gives children the foundation for communication. It is a huge component of reading and comprehension, too! After we picked Big Sister up and got home we enjoyed our harvest. One of the coolest things about loquats is that they have large seeds and each one contains a different number of seeds. Sometimes one, sometimes two and sometimes three. Last year, we had two that contained five seeds. We did a special loquat-5-seed dance. It was great! But this year most of ours contained two or three seeds each. I cut each one (cut the stem side off, then slice around the fruit not through it), I would hold it out to Little W. He would say "open it" and I'd open the fruit slowly and dramatically to reveal how many seeds were inside. I'd pop them out and we'd count them. We got to practice counting a lot! With Big Sister, we talked about predicting. We'd look at the size of the fruit and see if we could guess the number of seeds. We also worked on waiting her turn (she wanted to call out the total number of seeds each time!). 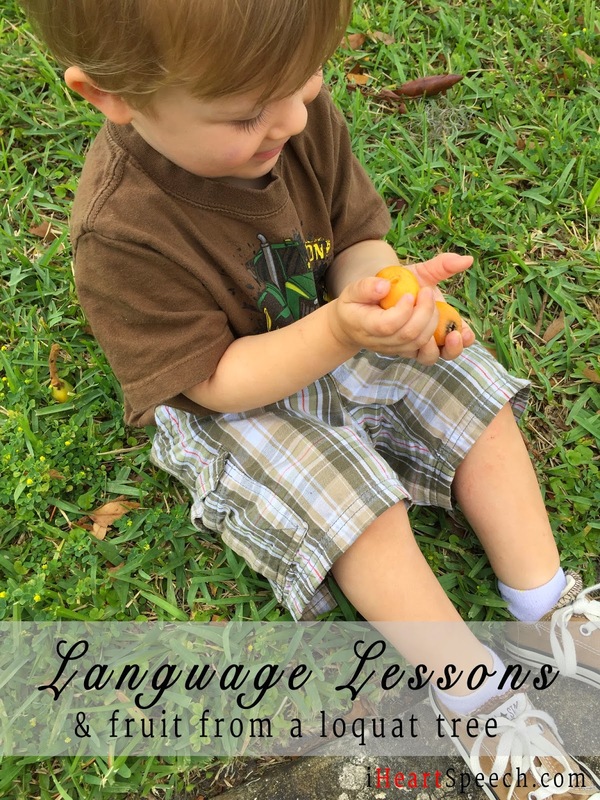 It can be challenging to come up with language development activities for a 2 year old and a 5 year old at the same time, but this activity worked great! With even older children you could have them help you cut open the fruit and take out the seeds. Once the bowl was full, we enjoyed our harvest! On a safety note, I have heard that the seeds can be dangerous if consumed (in quantity, but why chance it! ), make sure your children do not eat the loquat seeds! Do something better with them...plant them! We are soaking ours right now to see if any of them will start to grow. It would be great to have our own loquat tree out back!! 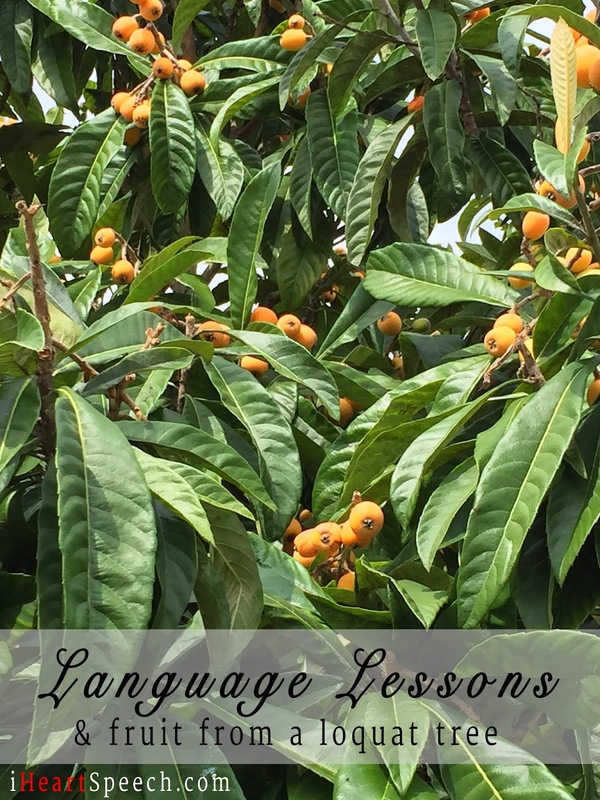 Do you have a loquat tree or access to one? What do you do with all of your fruit?